There are Gods in Star Wars? Apparently so, and even the evil Sith ones will smile on you on occasion. By explanation: I present a recently received present of a Dejarik game with a hand-painted board! They must have inspired the immortal T.Gatto, whom you’ll probably know of if you ever read the comments here… ever read ’em? Eh? Eh? Yes, the poor neglected comments section. But I’ll get to that later. But I digress… Tom’s present is much appreciated. And do you know, one of these days I’ll get around to reading the rules of Dejarik that he emailed me. Johnny’s rules tend to be unfathomable, fluid and uncannily always bring about the same result. We tried a draughts style approach which was quite good. Jumping opponents and taking them diagonally. The centre space was a ‘den’ where you could sit safely for one turn—4 times per game. You’re not allowed to attack from the den though. The first big supporters were Rod and Leanne Hannah of Blue Milk Special.com. BMS has promoted this site on and off over the 2 years it took to do. Big thanks to them! They even interviewed me for a BMS Podcast show. Sadly, it never ‘aired’, probably because we recorded 2 or 3 hours of chat, and editing it would have been a huge task for 2 people who are already very very busy—and up to their eyes with all sorts of creative work! Then there more of you who discovered the site on Facebook and have been the biggest commentators here and on FB. Tom Gatto – with over 160 comments! Neil Baker over – 130! And can I say that as well as BMS/The Hannahs; Neil Baker and Damien Slattery have been great advocates and for the site and given me lots of encouragement too. 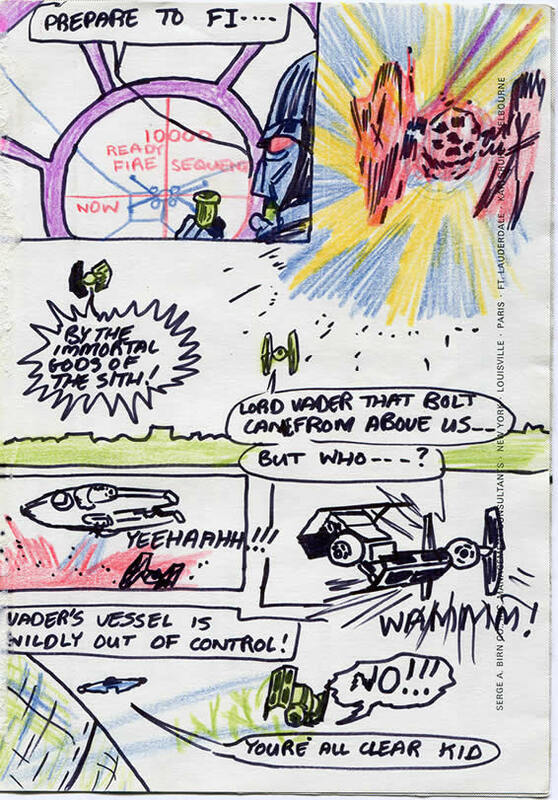 Do you know, that it was thanks to Neil that Bonnie Burton over at LucasFilm started following the comic, and she had the Star Wars Twitter account become a follower of SWa9 on Twitter! Wow! That was nice. And lets not forget, if it wasn’t for Neil—again!—Mark Hamill wouldn’t have taken a look at the comic! Mark freaking Hamill! Luke freaking Skywalker! Some day, when I do a Kickstarter, and print this thing as a lovely book, I’ll know who to send free copies to. And it won’t just be Mark Hamill. T Gatto! An active and eloquent supporter of all things that are Good and Star Wars. What can I say? I’m lovely. Now send me money. Today’s page is pretty awesome despite its well drawn nature – lots going on and a nice flow to the panels! Really don’t want this to stop. So here’s my suggestion. Lets close our eyes, use our ‘off’ hands, and draw The Empire Strikes Back. Next stop, starwars: age 40-ish. A Vader “No!! !” at the end of Star Wars! I like it! The guy just likes to say Noooo!!!! Excellent work on the comic and web site. Hope you continue it in some way. Surely this is nearing the end of ANH, does this mean no more. SWA9, or do you have more in store? I’m hoping the latter.